Christian Meeting House – Church of Christ. 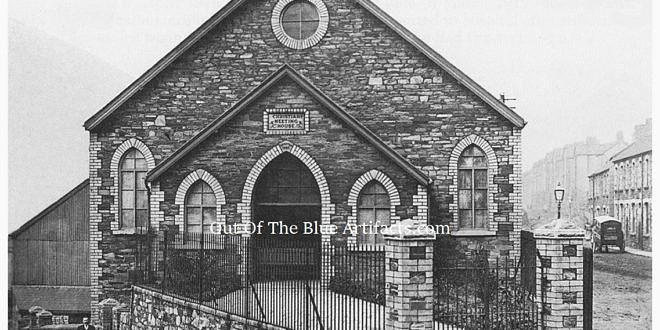 The Christian Church of Christ Movement started in Abertillery in the early 1900’s. They had no creed and the New Testament was their law. They believed in mutual ministry and had no sectarian aims and did not believe in public collections. They pleaded for a return to primitive Christianity. 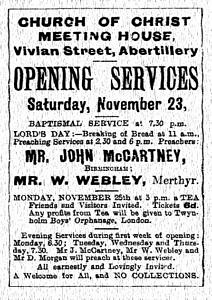 Their very first meeting was held on Friday 23rd November 1906 at the Oddfellows Hall, Abertillery with a membership of just nine worshippers. 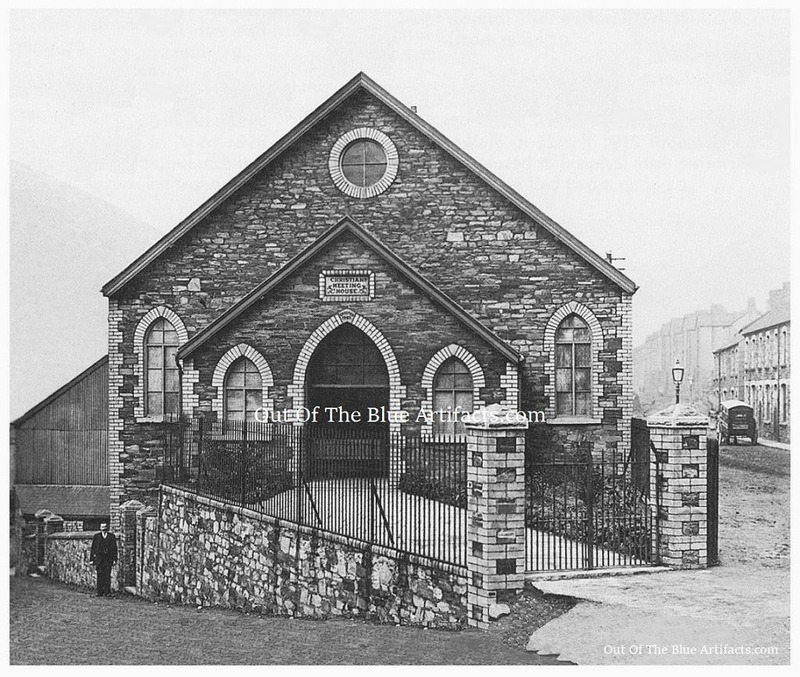 The members were a break-away group from the Ebenezer Baptist Church, Abertillery and the Bethany Baptist Church, Six Bells with their subsequent meetings being also held in the Oddfellows Hall. In July 1907 they proposed to have their own church built at the junction of Castle Street and Vivian Street and presented the plans for such to the council. The Official Opening of the Church. On Saturday 23rd November 1907 the Christian Meeting House – Church of Christ, was officially opened. Mr J. McCartney and Evangelist of Birmingham and Mr W. Webley of Merthyr preached and five candidates were immersed. On Monday 25th November 1907 a public tea and and meeting was held, the tea tables were attended to by the following – Mesdames Samson; Gadfield; Simms; Harvey and Portman: Misses Lewis; Portman and Willis: Mr Webley presided over the meeting and addresses were given by Mr D. Morgan the chairman of Treharris and Mr J. McCartney. Mr A. H. Willis spoke to the meeting about the founding of the movement in the previous year and told how they had no quarrel with other churches in the town and they appealed to them to do all they could to work together against the common foe. It was stated that the meetings were to continue through the week and also Sunday and Monday. The church was built at the junction of Castle Street and Vivian Street. It contained a main hall and two schoolrooms, it provided accommodation for 650, the central hall for 350 people and the schoolrooms for 300 children. At some point during the Great War the church ceased and the building remained closed. 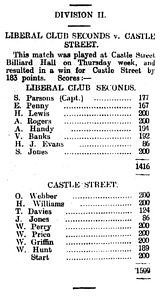 On Thursday 22nd January 1920 Mr William John Davies of Hafod-y-ddol, Nantyglo applied as tenant of the hall for a licence to play billiards and bagatelle at the old premises called the Christian Meeting House, Vivian Street and Castle Street, Abertillery. His application was approved, it was renovated, refurbished and re-opened as a billiard hall. The building was officially named the Castle Street Billiard Hall and was owned by Mr James Marsden of Greenmount, Wigan, a manufacturing clothier, Mr John Wycliffe Black, a boot manufacturer of the Elms, Stoneygate, Leicester and Mr Charles Green a wholesale grocer of 33 Wellington Road, Fallowfield, Manchester. After the license was issued the owners installed five full sized billiard tables in the upper room and three billiard tables, along with three smaller rooms on the ground floor. On Wednesday morning 9th April 1924 the hall suffered a disastrous fire and was burnt out. At 12.20am Mr Pryce, manager of the Gaiety Hall, Carlyle Street, Abertillery observed flames coming from the Castle Street Billiard Hall and ran to the fire station to raise the alarm. Within three minutes the fire engine was at the scene, in charge was Captain Rancombe and Superintendent Thurling with eleven men. Even though there were two hydrants outside the hall the water pressure was too low for pumping and the firemen were powerless to stop the flames. The roof of the hall collapsed into the upper floor which engulfed the interior. Fear of the fire spreading to the houses close by receded as the wind blew in the opposite direction though as a precaution the fire crew stayed at the scene until 4.30am and Superintendent Thurling, along with the engine remained until 8.00am the following morning. The fire had not only caused a considerable amount of destruction to the building which was estimated at a loss of over £2,000 but also a great amount with the loss of eight billiard tables, their accessories and furniture. At the time of the fire the hall was occupied by a tenant Mr A. B. Stephens, his wife and family but there was no mention of them being in the building at the time. In February 1927 the St John’s Ambulance Brigade, which had been in existence in Abertillery since 1906 and had been looking for an Ambulance Hall for several years formed a committee to actively acquire premises of their own. They later purchased the derelict Castle Street Billiard Hall with help from the Miners Welfare Fund and proceeded with its re-building. In October 1930 the old burnt out hall had been rebuilt. On Saturday 21st February 1931 the building on Castle Street once old Christian Meeting House come Castle Street Billiard Hall was formally opened as a St John’s Ambulance Hall. When the Rose Heyworth Colliery Pithead Baths were officially opened in May 1931 the company and dignitaries who attended the opening ceremony were entertained to luncheon at the Ambulance Hall by the Lancaster Steam Coal Co and Sir John Beynon presided. The hall remained an Ambulance Hall though is now derelict.